A Floating Button, if enabled, appears on a product page if the chosen product is out of stock. 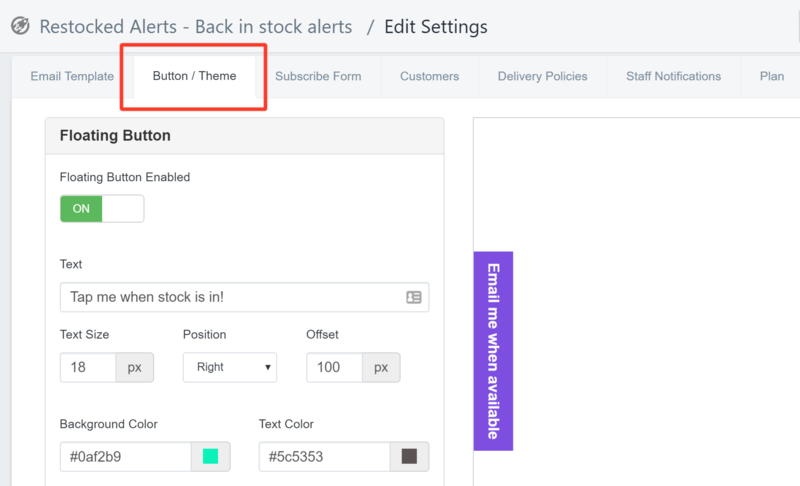 Customers can click on this button to receive an email notification as soon as the item gets available. Floating Button Enabled - You can set this to ON or OFF to enable or disable the button. Text - You can change the default text on the button and enter the text that you prefer. Text Size - You can adjust the size of the text on the button. Position and Offset - Choose where to place and how the button is placed. Background and Text color - You can choose your own colors for the text and background color on the button. Your Floating button is now modified.